Volvo Trucks has been busy these last few years taking on the world with some amazing videos and stunts. So of course they are now ready to take on the ultimate challenge - a race between a Volvo FH and one of the world's fastest sports cars - the Koenigsegg One:1. A Volvo FH in a race against one of the world's fastest sports cars. 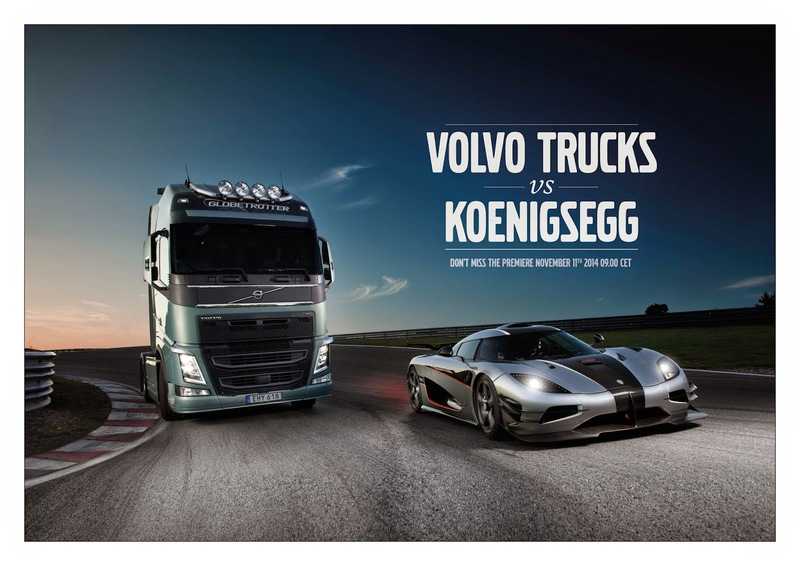 This is the scenario in Volvo Trucks’ upcoming film ‘Volvo Trucks vs Koenigsegg’. The aim is to put the new I-Shift Dual Clutch transmission, based on sports car technology, to the ultimate test. Following the release of its newest product feature, the I-Shift Dual Clutch, Volvo Trucks is getting ready to put its technology to the test. On the 11th of November, Volvo Trucks will show the world what happens when you race a heavy duty Volvo truck against the world's first megacar – the Koenigsegg One:1. “Matching a Volvo FH against Koenigsegg One:1 is the perfect challenge to see if our newly launched I-Shift Dual Clutch transmission lives up to expectations in terms of driveability and driving comfort that comes with seamless gear shifting,” says Per Nilsson, PR Director at Volvo Trucks. Behind the wheel of the Volvo FH we find the motor racing personality Tiff Needell, who is today a presenter on the British motoring TV series Fifth Gear. The race takes place at Ring Knutstorp in southern Sweden, a track known for its hills and sharp curves.